MADHUBANI: Keeping ill for the last some months, 92-year-old Padmashri Mahasundari Devi, the doyenne of Mithila painting, breathed her last at her native village, Ranti, near Madhubani on Thursday morning. Her last rites will be performed on Friday, said her eldest son, Bipin Kumar Das. She has left behind a large family including three sons, daughters and grandchildren to mourn her death. Barely literate, she took to painting when only a child and acquired proficiency in the art form under the guidance of her aunt, Devsundari Devi. She was renowned for her mastery over Sikki work, 'sujani' craft, clay work and paper mache apart from Mithila painting. 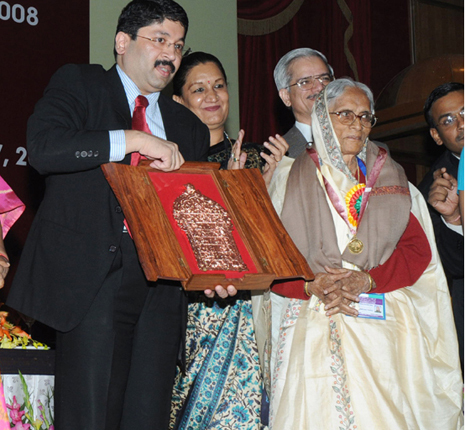 Apart from over two dozen national and state awards to her credit, the two prestigious awards __ Padmashri and Shilp Guru __ came her way in 2010. Widely travelled, the late Mahasundari Devi did her last painting in 2011, family sources informed. The news about her death was widely condoled by a cross section of people here. The void created by her death in the social and cultural life of Mithila can hardly be filled up, condolence messages unanimously reflect. Prominent among those who sent prompt reactions on getting the sad news included Narendra Narain Singh 'Nirala', retired district and sessions judge Sachchidanand Jha, retired DIG Chandra Shekhar Das, Lalit Narain Mithila University Teachers Association (LNMUTA) president Chandra Mohan Jha, Kuldhari Singh and Prof S N Mishra.